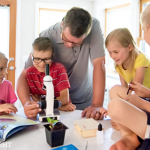 I read this article and wanted to share it with you: A Typical Day in the Life of a Large Family Homeschool https://blog.sonlight.com/typical-day-large-family-homeschool.html. Two chickens are roasting on the counter in the biggest slow cooker you’ve ever seen. A lanky teenage boy is sprawled on the couch reading Willa Cather’s My Antonia. A blond preschooler is clambering over the end of the couch with several sections of the letter “A” he just built on the Handwriting Without Tears mat that’s now abandoned on the floor. A mother is in a chair reading aloud Daughter of the Mountains above the sound of a dishwasher that’s on its second load of the day and a kindergartner who is recreating the battle for the Alamo with plastic army men. In various spots around the room there are children building with blocks, finger knitting, drawing, and finishing a late snack of popcorn under the kitchen table. It’s anything but quiet, but it’s everything I’ve come to expect from my days. 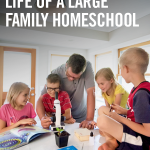 Welcome to my large family homeschool. One of those students has profound special needs. The children I’m teaching are 16, 12, 10, 8, 6, and 3. Like every year previous, it’s been unique, with its own challenges and joys. I have only one high schooler this year, and his need for direction is fairly low. He’s learning with Sonlight’s HBL 400, which allows for zero planning on my part and a great deal of latitude for his weekly schedule. 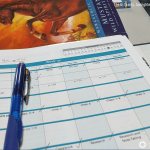 Through years of being accountable for his work and showing initiative, he’s gained the privilege of taking the Student Guide as a weekly to-do sheet. As long as it’s all done by Friday, I don’t care in what order he chooses to do the work. 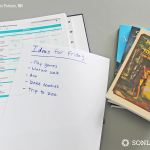 Each morning, I flip open the Instructor’s Guide to the appropriate week and we go over his intended game plan. This allows me to make sure he has access to what he needs and gives me an idea of how he’s proceeding. If he’s turned in an essay or current event the afternoon before, this is also when I return it and we discuss his work. From there, he heads into the trenches, and I assemble the (younger) troops for our Morning Basket. The youngest five children and I spend the next hour and a half to two hours in our Morning Basket time. There’s no actual basket involved, but that sounds so much sweeter than just saying that this is when I sit in my favorite red reading chair and we work through Read-Alouds, History, Life of Fred, Bible memorizing, poetry, art study, geography, Science, composer studies, and singing hymns. Three of my children take music lessons, and they’ve already logged their daily practice time, so Morning Basket time is just for focusing on the subjects we all enjoy together. We’re using a modified HBL F Eastern Hemisphere for this group, taking into account our special family circumstances. We are a home-based missionary family which means that my husband and older children frequently travel internationally throughout the year. When my husband is home however, we try to have lunch on his schedule. This is a good break time for my social teenager, who after two hours working on the couch or at the kitchen table is ready to talk with a fellow human. My younger kids, too, who haven’t been still for the entire morning time (far from it) get a chance for a change of pace. Lunch is usually leftovers. As things are heating in the oven, the younger kids clean up their handiwork items and LEGO, help me move laundry, join in emptying the dishwasher, and find excuses to run outside and stretch their legs. We eat and talk with Daddy before he heads back upstairs to keep working. Post-lunch, the younger kids take a short rest time. My independent readers take their current books to their beds for half an hour, and those who can’t yet read are allowed to listen to audio books. At the end of this window, they burst from the house as if they haven’t seen daylight in years. Unless it’s inclement weather, I expect them outside, roaming the farm for 45 minutes or so. I take this opportunity to do more general housekeeping and check in again with my high schooler. Now’s the time for those deeper discussions on questions raised from his morning readings. If at all possible, he’ll head to the computer to work on math at this point, but if he’s working on chemistry, that's usually the first thing he’ll tackle in the afternoon. I’ve learned that the easiest way to reassemble my large family for an afternoon of seatwork is to ring the dinner bell out front and lay out tea. Someone is charged with getting a cup up to Daddy, but my teenager rarely joins us. Instead, this is when I focus with the younger kids on the more concrete 3 Rs. My preschooler finishes his tea and either grabs a tray from our selection of Montessori-based table activities, sits on my lap with picture books, finds someone willing to be distracted with a toy, or turns the entire living room floor into a carpet of puzzles. I sit at one end of our 10-foot table or in my beloved red reading chair. Then the four elementary-aged children rotate through math, language arts, and any other individual work that needs doing. I won’t be coy: this is the craziest part of my day. Without my absolute attention (no texting allowed!) this window could easily devolve into chaos. 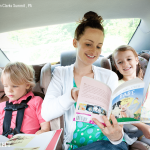 We have an understanding that only one person can have Momma’s attention at a time, and if it’s not your turn, you grab the book (for reading, stickers, or coloring, depending on skill) under your chair and entertain yourself until it is. Does that work perfectly? Not on your life. But it make me feel a little less like I’m playing whack-a-mole for an hour and a half. 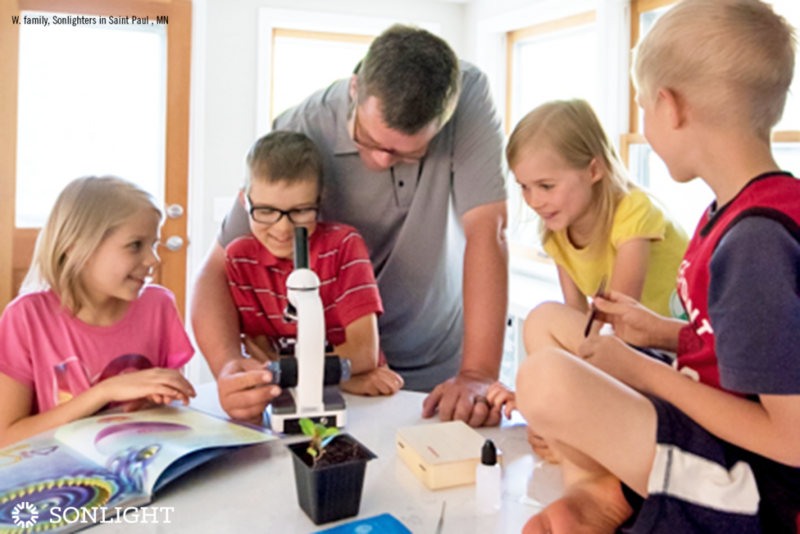 We save science experiments and art projects for the end of the day, both because they’re good motivation and because they require the most clean up. We end every day with a general house tidy-up. We’re finished by 4 p.m., which is also when my husband ends his work day. My high schooler and I have a final, quick check-in where he updates me on his daily progress and turns in any work that needs grading before walking to the YMCA for his daily workout. The younger children usually spill back outside, although sometimes they will scatter; some are fond of afternoon chess matches, and others have the habit of racing scooters down our gravel drive. Before they go to bed, my husband will finish off their school day, though they don’t suspect it. 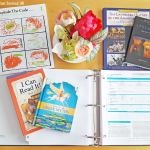 He will read a chapter to us all from one of the books in their History / Bible / Literature program, making the load of this homeschooling mom’s day that much lighter in the long run.